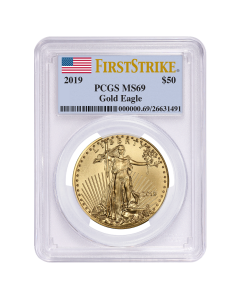 Gold Coins issued on the very first day of launch have always enjoyed a premier standing in the precious metals market. When the coins in question are none other than graded specimens of the famed American Gold Buffalo Coins, their popularity knows no bounds. NGC has inspected these particular 2018 1 oz NGC MS-70 First Day of Issue Gold American Buffalo Coins before grading them and sealing them into secure plastic slabs with an attractive buffalo label. MS-70 grades are reserved for coin specimens of the highest quality. NGC is known for its stringent quality standards, and the level of perfection these coins exhibit makes it all the more apparent. Inspected at up to 5x magnification to ensure the absence of any and all imperfections in finish, design, and structure, these American Gold Buffalo Coins are among the best coin specimens launched on the first day. Both investors and collectors are attracted to graded gold coins, albeit for different reasons. While collectors appreciate the flawless finish of an MS-70 coin and its ‘First Day of Issue’ designation, investors love the diversification that a graded American Gold Buffalo specimen brings to their portfolio. Grab these 2018 1 oz NGC MS-70 First Day of Issue Gold American Buffalo Coins before our limited stocks run dry.